Risottos are one of my favourite dinners. When made right, they are rich and creamy, but not too heavy or stodgy. 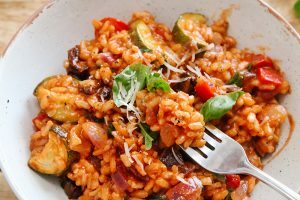 Plus, risotto rice picks up flavours so well, so there is a lot of potential to make a seriously amazing-tasting dish when you’ve got the makings of one in your stock cupboard. 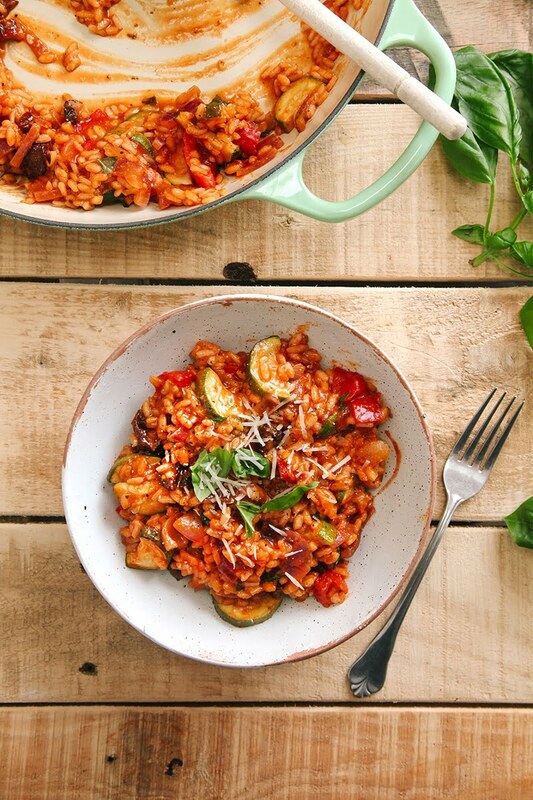 And I have a new favourite risotto recipe: This Tomato & Roasted Mediterranean Vegetable Risotto! Sooooo flavourful and a dish everyone can enjoy, vegans and meat-eaters alike. Plus, risottos are naturally gluten-free too! Stirring regularly. You don’t have to stand over the stove, stirring constantly but regular stirring will help the rice release it’s starch. Adding the stock a cup at a time. Adding the stock in all in one go is simply just like boiling rice but we want a creamier result than that. So adding the stock in a bit at a time, waiting until each ladel-full has nearly been absorbed will help create that gluey texture. “Mantecatura” – Loosely translated as “enrichment” or to give something a buttery texture. This is achieved at the end of the recipe, when the rice is almost cooked and the liquid has very nearly been absorbed. Remove the rice from the heat and stir for a couple of minutes, adding an extra ingredients, such as dairy-free butter, oil, vegan cheese, nooch or fresh herbs. Admittedly, I know roasting the vegetables does add extra time and effort to this dish BUT I do think it’s absolutely worth it, flavour-wise. If you’re short on time (or feeling lazy) feel free to sauté the vegetables instead. Preheat the oven to 180C / 350F and add the olive oil to a roasting tin. 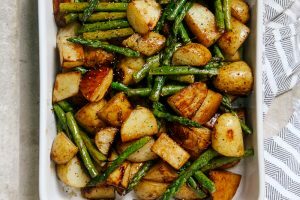 Chop the vegetables into small chunks and spread out in the tin, adding the salt and pepper before giving everything a shake to coat. 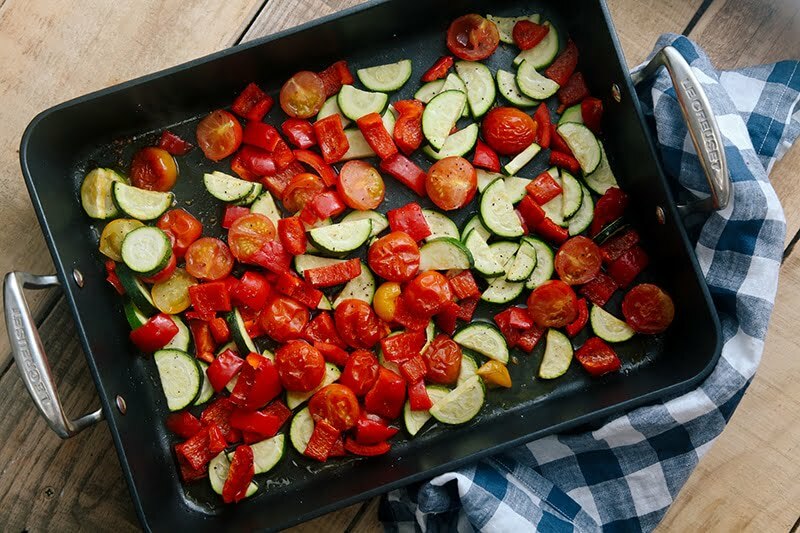 Meanwhile, add olive oil to a shallow casserole dish or large frying pan, on a low-medium heat. Sauté the onion for a few minutes before adding the minced garlic and cooking for another minute. Stir in the rice with the vinegar and stir for approx 30 seconds, to coat it in the oil. Pour in the passata and vegetable stock, 1/2 cup at a time, alternating between the two. Allow each amount to be absorbed by the rice before adding the next. After 20 minutes, add in the sundried tomatoes and the roasted vegetables. Give everything a stir, adding more liquid if needed, and cook for a further 5 minutes until everything is cooked through and the rice is done. Remove from the heat and stir in the basil, salt and pepper and vegan cheese (if using). Feel free to stir in any extra oil or dairy-free butter at this point for an extra creamy risotto. 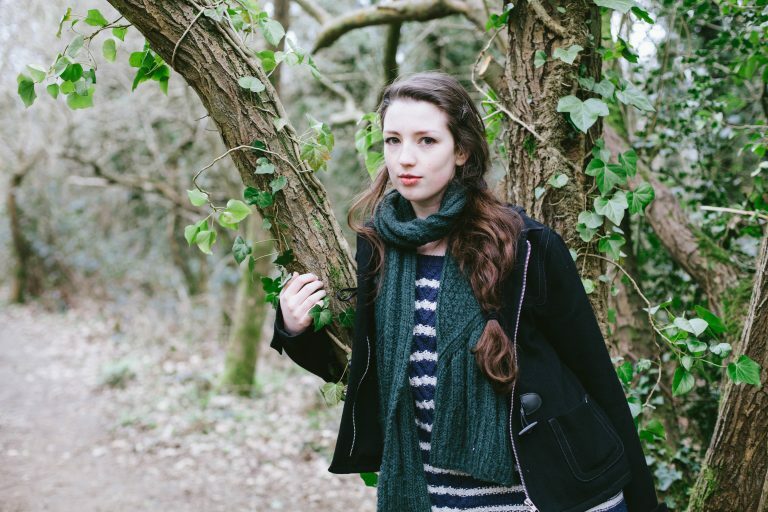 Do you think dried basil work the same as fresh? 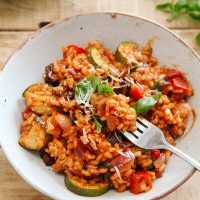 Fabulous risotto. Like others I had to have at least 4times the amount of stock and passata. The rice would have gone on absorbing even more but served it once it was cooked enough. A superb meal, served with a crunchy green salad. I can not find passata where I am from, is there an alternative for it? This was really good. I had my doubts when it was cooking because I kept having to add water, but eventually it came around. I think next time I will use veg broth, roasted portobello mushrooms and maybe a Beaujolais instead of the vinegar. Thank you so much for sharing this. The vegan butter made it extra decadent. Oh my God. I've just made it, it's just what I needed.. Thank you very much!!! It's creamy, rich in flavours, helathy, very comforting. 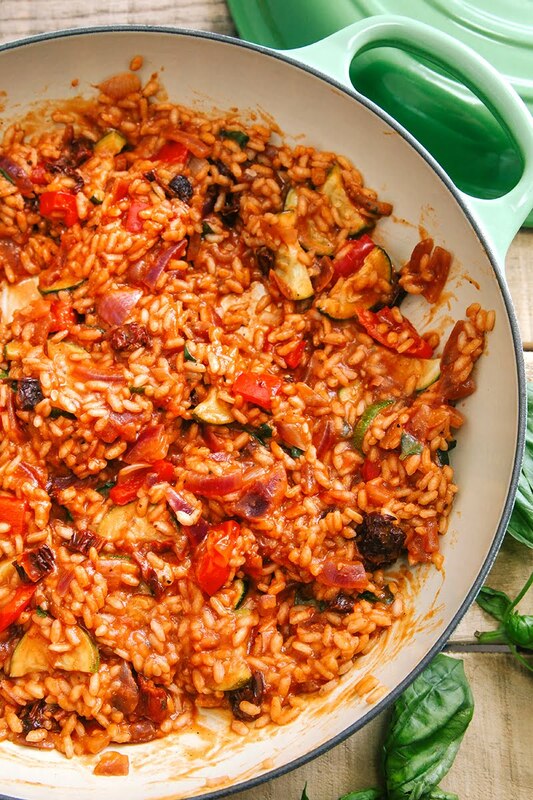 And easy to make, I used regular basmati rice (didn't have risotto :c) and it's amazing too! 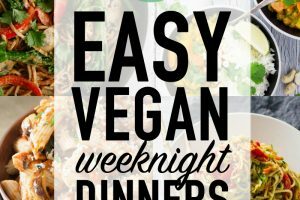 I just made this tonight and it is soo good! My new favorite! After you put the passata and the stock do you have to keep on stirring for the next 20 min or lower the temperature maybe? Because mine keeps on splashing and sticking to the pan as crazy! Or the lid on? Never made a risotto before, but recipe was really easy to follow. Simple, tasty and effective! Made this for supper tonight - it was absolutely delicious! Am not vegan - so we used normal parmesan, but mostly kept to the recipe. Didn't have arborio rice, so used Spanish Paella rice instead - this meant I had to add WAY more liquid (an entire pint plus splash of red wine!) and had to cook it for much much longer (about 30 mins). Also subbed finely chopped toms for passata, white onion and a couple shallots for the red onion and dried basil for fresh (which hubby prefers). This recipe will be added to our regular favourites I think. Thank you Aimee. Made this for supper tonight - it was absolutely delicious! Am not vegan - so we used normal parmesan, but mostly kept to the recipe. Didn't have arborio rice, so used Spanish Paella rice instead - this meant I had to add WAY more liquid (an entire pint plus splash of red wine!) and had to cook it for much much longer (about 30 mins). Also subbed finely chopped toms for passata, white onion and a couple shallots for the red onion and dried basil for fresh (which hubby prefers). This recipe will be added to our regular favourites I think. Thank you! Just made the risotto and my family loved it. The only thing is that I used regular white rice instead of the risotto rice cause I didn’t find it at the store. After adding all the liquid, the rice was not cooking and kept turning more and more pasty, so I added a lot more water and tomato purée little by little, until the rice was cooked, but took another 15 minutes extra. Otherwise, great recipy! Fantastic recipe! Best risotto we had in a while. I made this dish for my vegan husband, and my mostly vegetarian (but super picky) 14 year old son. My husband loved it. My son really loved it and had two servings! It is very rare for my son to like anything new, this was such a hit. Thank you for sharing your talent. This looks so yummy! 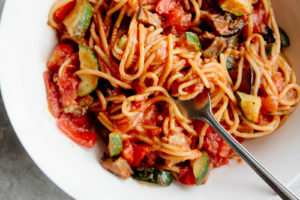 In place of the passata can I use tomato paste mixed w/ tomato sauce? What would you recommend? This was just not good. Wayyy too much tomato flavor. Sorry you didn't like the tomato flavour but it is the main component of this recipe. Perhaps the brand of passata was concentrated? If so, you can offset this by using less of the passata and more water. We're making this tonight. Can't wait. It looks and sounds delicious. Love the look of the Le Creueset roaster, but they don't have it on the American website :( Such a shame. They make awesome cookware. Made it for dinner tonight. So yummy!! Already looking forward to eating the leftovers for lunch tomorrow. This looks delicious! I love all of those flavors! When is dinner? I have a mushroom risotto that I make and love but I'm looking forward to trying this combination with roasted tomatoes. Looks delish. This looks extremely tasty. I love risottos too, and they are just perfect for this time of year. Saved for later as I am definitely going to try this. This looks like one of the tastiest risottos I've seen in a while. Pinning it right now so I don't forget to make it! Love this! Can't wait to make it - do you think leftovers would freeze well? Hi Keera! I've not tried freezing this recipe exactly but if you're going to freeze it, leave it out the night before you want to serve it and let it defrost slowly for the best result. Let me know if you give it a try! Ah I love that roaster! And the risotto of course. It looks so tasty. My ideal dinner. 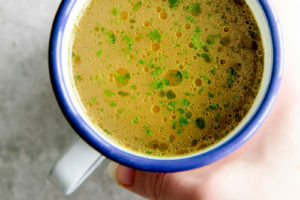 I make risottos a lot so will need to try this one! Risotto is the ultimate comfort food. 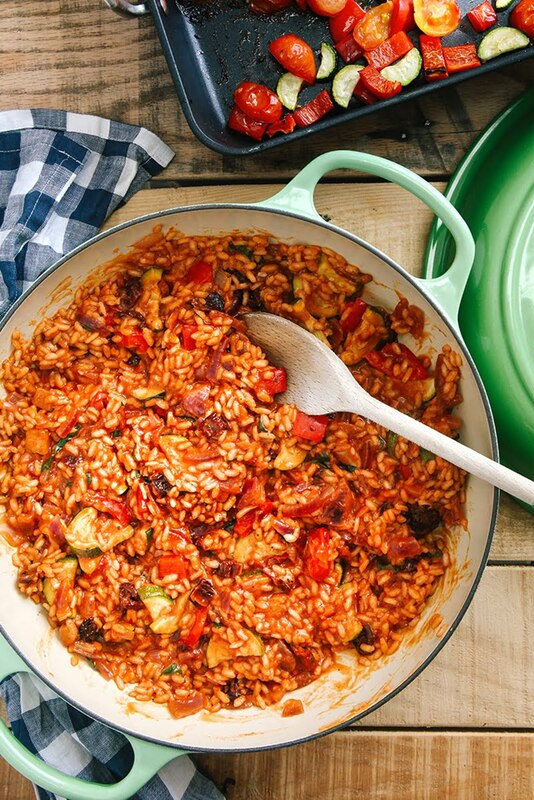 I love that you smothered the rice in tomato sauce and then covered it with roasted veggies. I'm so craving a bowl of this right now. 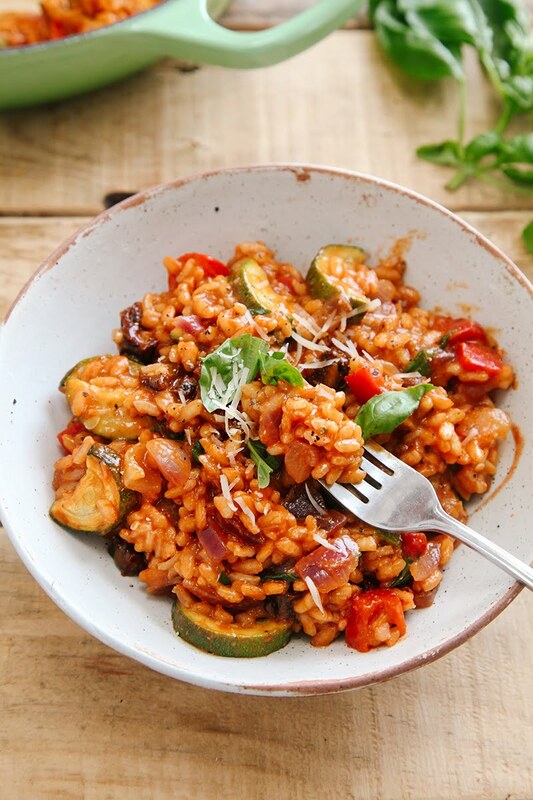 I love risotto, and this looks so delicious! I have a lot of zucchini and tomatoes in the fridge, so this just might be tonight's dinner. Oh, I adore risotto! I agree, it's pretty darn easy. Time consuming, but easy nonetheless. Loving this roasted vegetable version. Perfect for my end of summer garden veggies that need to be used! Oh my word, this looks and sounds so blummin' delicious - I want to come over for dinner right away. I love your creative use of these ingredients!